Maybe it’s the sporty haircut, but no one here at the Casa del Mar hotel restaurant in Santa Monica seems to recognise Wasikowska, even though she’s one of the highest-grossing actresses in the world (in 2010, her films made $1.03 billion, tying with Johnny Depp and outgrossed only by Leonardo DiCaprio at $1.1 billion). Perhaps the 23-year-old’s quiet demeanour also helps her slip by unnoticed, or maybe it’s her casual attire – sensible black flats, black tights, a flowery knee-length skirt and a simple pink t-shirt. “I think it’s because I live in Australia and I don’t get too much into the Hollywood scene,” she says, explaining her relative anonymity. “Living far away from LA has been the best way for me to exist within this industry. It’s good to be able to step away from here and into my personal life, and keep the two separate.” She pauses. “You know, before you arrived, the weirdest thing happened,” she says, her smile warm. Turns out a journalist from a different publication had sat with Wasikowska for a full five minutes, having mistaken her for someone else. And she had played along, not realising. “We were chatting for a while,” she confesses, “then she looked confused and asked me my name. I said, ‘I’m Mia,’ and she was like, ‘Oh. Whoops.’” It’s hard to imagine anyone making that mistake with DiCaprio or Depp, but then Wasikowska really isn’t bothered by her inconspicuousness. Rather, she’s enjoying it while she can. The film is littered with metaphor and symbolism, including a recurring egg motif — early on, India is seen rolling hardboiled eggs along a table and cracking the shells; later, you catch a glimpse of white plates arranged in a circle on a wall, a yellow plate in the middle like a yolk. This, says Wasikowska, stemmed from Chan-wook feeling that her character was like “a little chicken in an egg, pecking her way out and breaking the shell.” Does Wasikowska ever feel that she is “only an egg”, to quote Robert A Heinlein’s 60s SF classic Stranger in a Strange Land? Or is she a chick? Where exactly is she on her personal egg-to-chick trajectory, or has she already hatched into the actress she always wanted to be? Her parents have always been supportive of her career choices, although were initially surprised when she quit dancing and decided to get into acting. “They were a little worried at the beginning because it seems so out of reach, being in Australia and trying to make it as an actress,” Wasikowska says. “But I really didn’t like the dance industry. It’s kind of brutal.” She still dances every now and then, although it’s mainly in her bedroom, to favourite bands like First Aid Kit (she also digs Bob Dylan and Nina Simone). “I feel a bit stifled when it comes to crazy dancing in a club. Maybe I should try it though,” she ponders. “Maybe that would help me be more badass...” She is also a gifted photographer, shooting photos, often onset, using one of her Rolleiflex, Holga or Leica cameras. In 2010 she was shortlisted for the Australian National Photographic Portrait Prize for an onset photo of Fukunaga and Jamie Bell, her Jane Eyre co-star. 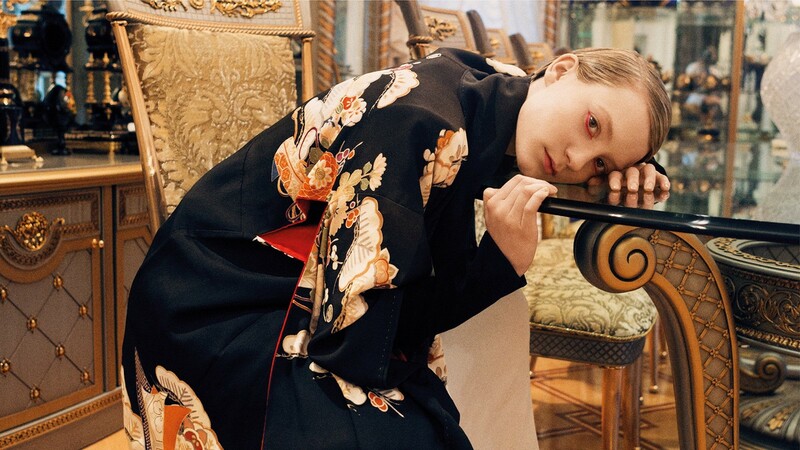 Photography, piano, ballet, acting – the list of Wasikowska’s talents grows ever longer with time.